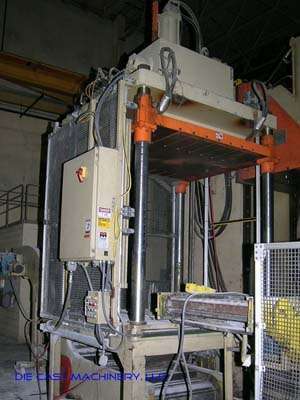 For Sale: One - Used - Second Hand - Metal Mechanics 75 ton die cast trimming press. Inventory item: DCM-2322. One used (second hand) Metal Mechanics, model DCT 75, new in 2006, 75 ton, wide bed 4 post vertical hydraulic trim press, serial number: 2781. Equipped with Allen Bradley SLC 5/01 controls, three (3) side core/punch circuits, Air Safety Ratchet, 72 inch left to right, by 65 inch front to back clearance between tie bars, 86 inch left to right by 78 inch front to back bed size, 80 inch daylight, 60 inch stroke, 60 inch shut height. DCM Inventory Number: 2322.